One of the greatest challenges in sports analytics is determining the skill of a player independently of quality of teammates. While a number of tools already exist (e.g. WOWYs in hockey), their (mis)use lends itself to significant limitations and collinearity concerns. This is where regression-based approaches can provide a more rigorous alternative in isolating a player’s true talent. An encouraging development in hockey analytics as of late has been Ryan Stimson’s Passing Project, which you can read about here. The goal of this post is to introduce a regression-based method to estimate an NHL player’s expected scoring performance independently of the passing strength of his teammates. 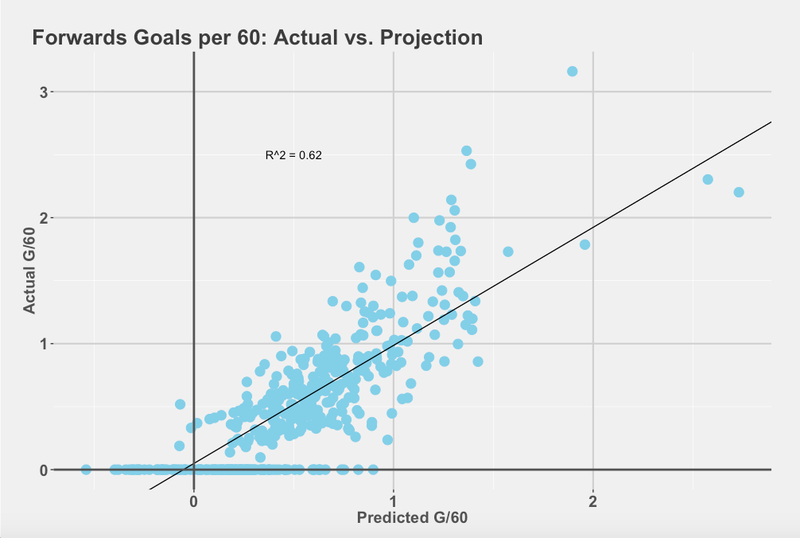 To this end, player and linemate data from Stimson’s Passing Project and Muneeb Alam of the 2014-2015 season were used to devise a rate-based metric of a player’s projected goals. 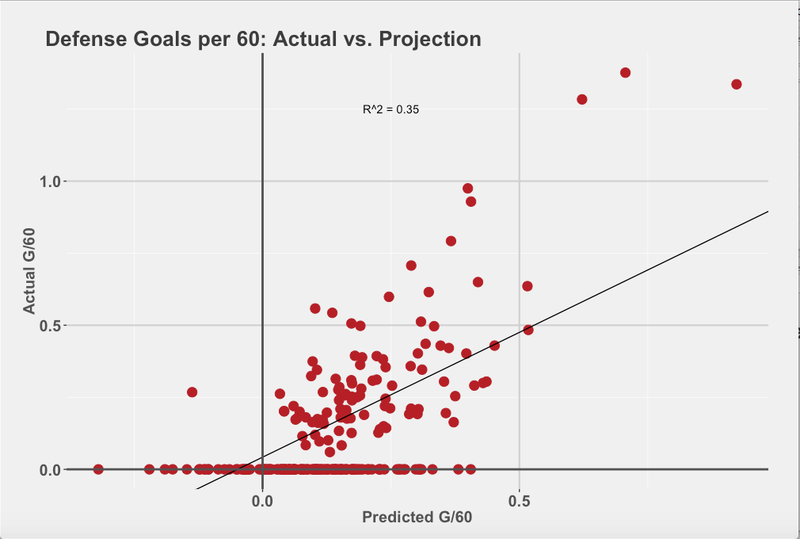 The difference between a player’s projected goals per 60 minutes and actual goals per 60 minutes will be called Delta Box Score or DBS. 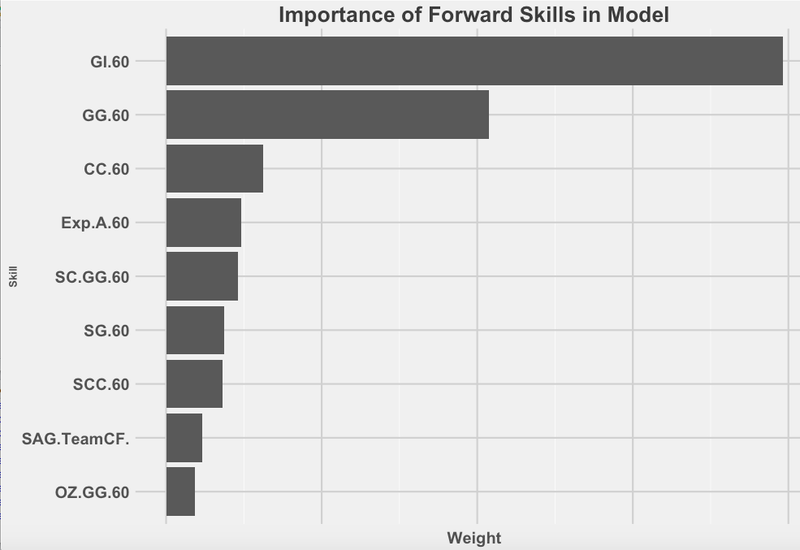 Using these variables, basic linear regressions were performed for forwards and defensemen separately to predict what an average player would produce assuming equal quality of teammates. The following graphs illustrate how favorably the forwards and defensemen’s predicted goals per 60 did against actual goals per 60 in-sample. My hope is that this is the very first step in devising player box score statistics that are independent of teammate strength, passing or other. In many ways, this is both a theoretical post and a work in progress. One of the reasons is the limitations of the data itself. Ryan’s 2014-15 season data that I used is already sizeable but more data – hopefully made available when this season concludes – is needed to run a more sophisticated model. While the preliminary results were encouraging, more testing on Ryan’s data needs to be done as well. In the meantime, it is also my hope that this post will spark constructive discussion in the community around context-neutral box score statistics as a better alternative to existing tools. Please do not hesitate to comment below or reach out via Twitter @DTMAboutHeart if you have any recommendations on how to move this project forward. 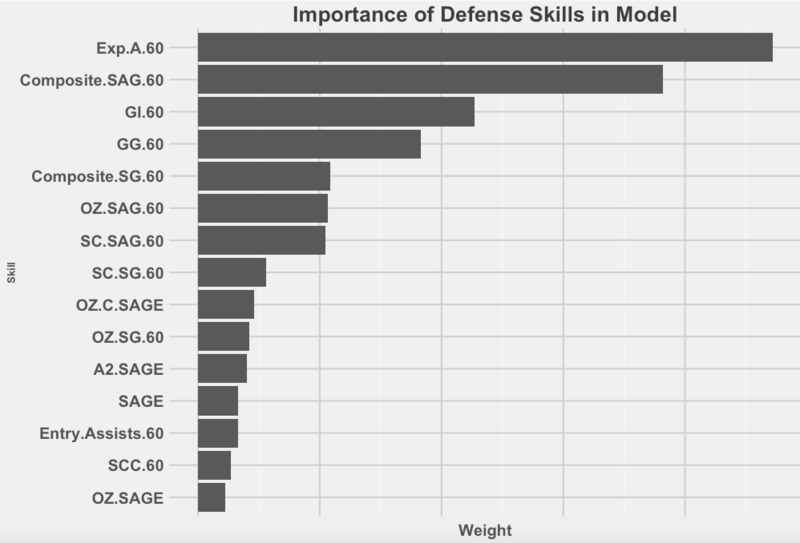 Special thanks to Ryan Stimson, Muneeb Alam and WOI for the data used in this post, and Asmae for her guidance. I’m interested to hear more about the variables used; they seem like they might have multicollinearity issues. They don’t necessarily have to be discrete, but some of will have considerable overlap, and I’m wondering if you have a way of avoiding too much double-counting. Secondary thought: I’m interested to see some out-of-sample testing on this. It’s a good start, but that out-of-sample stuff will really be where the rubber meets the road. Sorry if this is a double post, but could you please explain how it controls for teammate quality? It isn’t clear (to me), thanks.